Eli Butler (Kenai), Lilli Rice (Fairbanks), Taylor Calderwood (Kenai), Maia Siegel (Mat-Su), Quillan Jacobson (Mat-Su), and Mariah McCoy (Anchorage). The State Senior Division Record Book All-Star is Eli Butler (Kenai). Congratulations to these outstanding 4-H’ers and their involvement in local communities and beyond! The Senior Division State Record Book contest was established to encourage senior 4-H’rs to learn more about presenting themselves and their work through written word. As members grow in 4-H, they represent what 4-H is and what it can be. In doing so, they need to learn how to present information in a written format and a record book is an excellent way to do this. The top senior receives a $300.00 scholarship for state/regional/national event. Examples are Youth in Governance, Alaska Volunteer Forum, Western Region Volunteer Forum, Nation- al 4-H Congress, National 4-H Conference, Citizenship Washington Focus, and others. We are working at bringing unity to the record books across the state and welcome input on what you would like to see in a record book. I will be holding a class at the State Leaders Forum in Fairbanks February 28th and March 1st on “making your record books better”. You can email me comments to millerrabbits@yahoo.com or send them to your District office and ask them to forward them. The 4-H Presentation Contest helps youth develop communication and public speaking skills. Through the contest, youth have an opportunity to teach others about the skills they have learned in 4-H by developing and delivering a presentation. See contest results and Grand Champion presentations HERE! Do you know a 4-H’er who has a passion for government, history, political science, working with youth, public speaking, or leadership? If so, encourage them to apply for the position of Program Assistant (PA) at the National 4-H Youth Conference Center! On 4-H National Youth Science Day, October 9, 2013, millions of young people across the nation will become scientists for the day during the fifth annual 4-H National Youth Science Day(NYSD). NYSD is the premier national rallying event for year-round 4-H Science programming, bringing together youth, volunteers and educators from the nation’s 111 land-grant colleges and universities to simultaneously complete the National Science Experiment. In this year's experiment, 4-H Maps & Apps, young people will become geospatial thinkers as they design and map their ideal park, use GIS mapping to solve community problems and contribute data about their community to the United State Geological Survey (USGS). See article in Fairbanks Newsminer here! Registration for the 4-H Sustainable Harvest Camp is open! This is our third year offering a residential camp experience for youth ages 11-18 (Middle and High School) and we are very excited to be moving to the Eagle River Scout Camp facility for even more exciting harvest opportunities and fun activities! Please tell your family and friends that registration is open. We only have openings for 32 campers this year so if interested, contact us soon! The dates are Monday August 12 until Thursday August 15th. For the registration forms, scholarship information and camp checklist please call us at 796-6221 or email Susie at susie.wilkie@alaska.edu. Calling all middle and high school youth! If you love to explore, take care of the environment, hike in the forest and play by the sea, this camp will be the highlight of your summer! Local 4-H natural resource specialists will help lead the camp and answer your questions, guide marine biology exploration and join you as we discover the wonders of the woods. Campers will lodge at the Miller's Landing Cabins in Seward and have the opportunity to ride a water taxi, hike around glaciers, explore tide pools, clean up wild areas, enjoy the SeaLife Center, relax around a beach bonfire and much more! 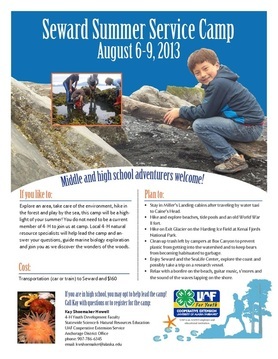 The camp cost is $160 and each camper must coordinate transportation (car or train) to and from Seward . Registration forms, camp supply lists and answers to all your burning questions can be found by contacting Kay Shoemaker in Anchorage (786-6345, kwshoemaker@alaska.edu) or Jason Floyd in Soldotna (262-5824, jfloyd1@alaska.edu). Space is limited and registration is open until July 31st. National 4-H Congress is the flagship event of the 4-H program. Youth from the United States and its territories have participated in this youth leadership development conference. The Congress provides youth, ages 14-19, a quality, educational, and cross-cultural experience that exceeds what any state independently provides. It is designed to address the needs and issues of youth while helping to develop capable, competent, and caring citizens. Those attending National 4-H Congress will enjoy workshops, cultural events, community service projects, and sightseeing. Applications due July 15, 2013. Congratulations to the 2013 4-H Scholarship recipients, Kira Freeman of Fairbanks and Paige Martin of Palmer! 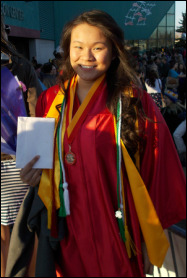 Kira graduated from West Valley High School and will study nursing. Kira excelled in the 4-H Horse Project from 3rd-12th grades, over the years, Kira has raised about $9,000 for cancer research through the annual St. Judes Ride-a-thon. Paige graduated from Mat-Su Career & Technical High School and will study equine barn- management/business. Paige began with 4-H as a Cloverbud in 2nd grade and shined in the 4-H Horse Project from 3rd-12th grades – won 1st place in Hippology at the Western National Horse Roundup in 2012. Beat Summer Boredom and "SPIN" this Summer with Alaska 4-H! A 4-H SPIN club is a "pick your project" club, in fact the first 2 letters SP stand for SPecial and the last 2 letters IN are for INterest! YOU choose your interest or discover a NEW one! Traditionally, 4-H clubs are community-based. Virtual SPIN clubs go beyond the block and bring kids and families together from all over the state! This summer SPIN clubs have gone cyber, all you need is your parents permission (let them know this is in your best "interest"), internet access at least once a week, project supplies (most are minimal, depending on project) and a yearn to learn! Summer SPIN 2013 goes cyber on June 10. Every Monday watch for a new and exciting activity for each project, after six weeks you have completed your first 4-H cyber project! A secure online venue is currently in the works for you to share your creations and experiences with other 4-H SPIN'ers! Sign up HERE!